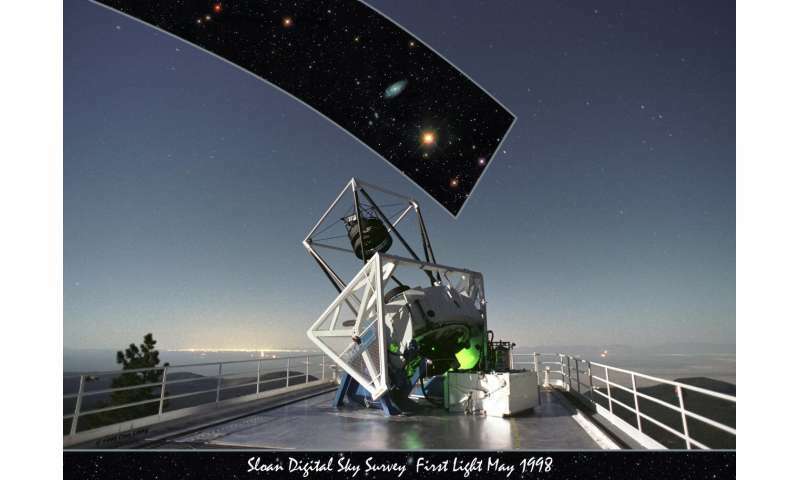 This week marks the twentieth anniversary of "first light" for the telescope behind the Sloan Digital Sky Survey (SDSS), which has gone on to create by far the largest three-dimensional map of the Universe ever made. Early in the morning of May 10th, 1998, the observers and engineers pointed the Sloan Foundation Telescope to the celestial equator and light went through to the survey's exquisitely sensitive camera. When dawn broke after a long night's work, SDSS observer Dan Long emailed his usual observer's log summarizing what happened. After describing the technical details of the observations, and before noting a series of newly identified problems to fix, he wrote: "Wow; What a night!" "That was the beginning of our survey, and we're still going strong twenty years later," says Michael Blanton, a professor at New York University and the Director of SDSS-IV. "We are now planning our fifth generation, called SDSS-V, and we're still using the same Sloan Foundation Telescope." The telescope's mirror, 2.5 meters (8 feet) in diameter, is small by astronomy research telescope standards, but powerful because it can see a large area of the sky simultaneously. 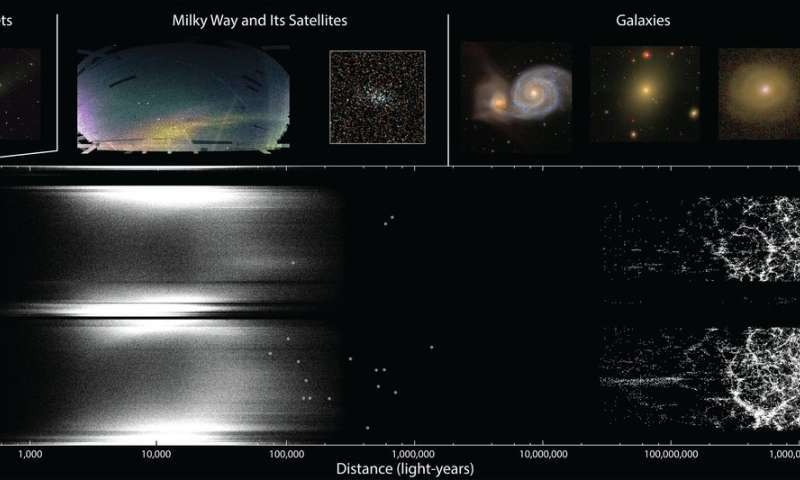 Astronomers have used it to make an enormous, highly-detailed map – a map which covers one-third of the night sky, with measurements of hundreds of thousands of Milky Way stars and distances to more than four million galaxies. All the data collected by the telescope is available free to anyone online, and all images are open access under the SDSS's Image Use Policy. The SDSS has measured the universe's expansion more precisely than ever before and has mapped how galaxies and larger structures grew over cosmic time, helping to establish our current standard model of cosmology. It discovered some of the nearest stars and the smallest companion galaxies to our own Milky Way galaxy, revealing how our galaxy grew by cannibalizing smaller galaxies. It has studied the Milky Way's disk of stars more completely than ever before, using infrared light to peer through the obscuring dust. It has studied the dark matter content of the Milky Way and distant galaxies, and found some of the most distant quasars known. The core of the project – the people who get the data upon which so many of the world's astronomers depend – sits the team of observers and engineers at Apache Point Observatory. A handful of the original team that led the efforts in 1998 are still with the project. Dan Long was promoted along the way to Chief Telescope Engineer, a position from which he recently retired. Many other members of the team have joined more recently. But they all share the excitement that Dan Long expressed the night of first light, and each night brings the prospect of new discoveries that will change the way we see our universe and make them and us say "Wow."